See Galway from our perspective. Whether you are going to visit Ireland and looking at our cameras to view our beautiful streets, or you just want to simply check out our weather, our cameras will tell you all you need to know. One Camera is facing down Shop Street and the other is facing towards the Latin Quatre. Galway City is always buzzing with excitment. In the winter, our beautiful Christmas lights and busy streets will lift your spirits. In the summer, the city buskers come out to shop street and there is a great feeling in the air. Everyday brings something different on the main street of Galway. Never miss those moments again with our live webcams. 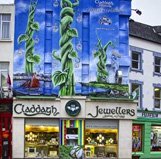 Claddagh Jewellers - From Galway With Love. Please note: This is a live stream and no information or images are saved. Our live webcams are not CCTV, therfore no footage is collected or stored for any use and can not be recovered at any time. 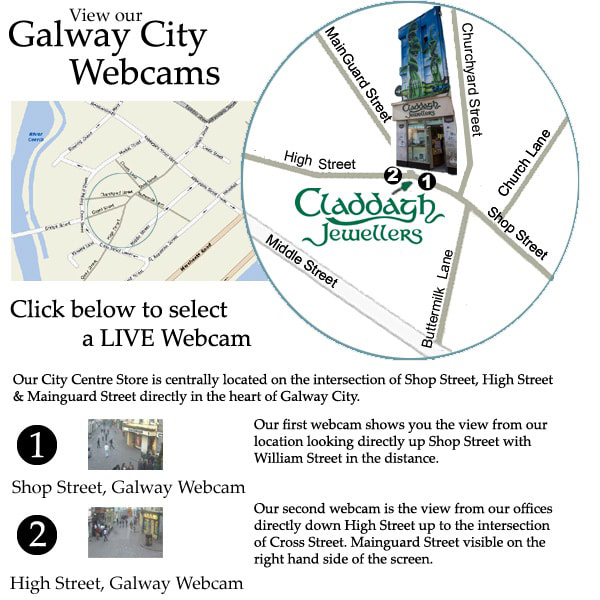 These webcams provide tourists and visitors with a view of the busiest street in Galway before they arrive to our beautiful city.